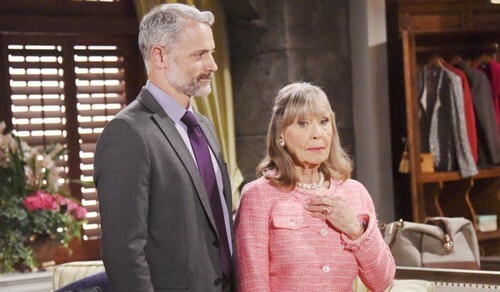 The Young and the Restless (Y&R) spoilers tease that Dina (Marla Adams) will continue to drive the Abbott family’s drama. Jack (Peter Bergman) and Ashley’s (Eileen Davidson) Jabot feud all started because of their opposing views on Dina’s care. They’ll soon resolve their issues, but more will emerge as Graham (Max Shippee) returns to stir up trouble. Fortunately, that means we’ll see lots of great material for Dina. In an interview with Soap Opera Digest, Marla Adams opened up about her role and what her Y&R future looks like. She noted that she was nervous when Sally Sussman, the show’s former head writer, asked her to return for an Alzheimer’s arc. “I was scared witless,” Adams admitted. She quickly asked Sussman an important question about her comeback. “I said, ‘Sal, are you bringing me back just to kill me off? She said no and that it was a big storyline,” Adams explained. Sussman actually left the Abbotts in the dark about Dina’s condition for quite some time. Now that Mal Young has taken over writing duties, Dina’s symptoms have gotten much worse. She certainly has more bad days than good ones. Nevertheless, Dina’s apparently sticking around for a while. According to Adams, Young said she’s “not going anywhere” when asked about his plans for Dina in Genoa City. Young has a personal connection to this storyline, so he’s committed to seeing it through and playing all the right beats. His mother battled Alzheimer’s for five years, so he took care of her after his father passed away. It appears Young is using that experience to show us Jack’s (Peter Bergman) difficult point of view. That could also be why Young chose to rev up Dina’s symptoms once he took over. Young told Adams that his mom got quite violent at times. He undoubtedly wants to give viewers the full picture of Alzheimer’s and the toll it can take. As for what’ll happen down the road, the hints have been rather ominous. Y&R highlighted how much Jack wanted to give Dina a holiday to remember. It seemed like the show was setting it up to be Dina’s last Christmas, but perhaps it was just her last lucid one. Regardless, The Young and the Restless spoilers state that Dina will be involved in some hot plots soon. Dina’s fate is inevitable, but Young can still let this play out slowly. Adams promised that the story would be “very compassionate and heartfelt,” so that’s what really matters. Do you enjoy having Dina on The Young and the Restless? What do you want to see in this storyline moving forward? We’ll give you updates as other Y&R news comes in. Stay tuned to the CBS soap and don’t forget to check CDL often for the latest Young and the Restless spoilers, updates and news.